A video was captured of a toddler dancing that is making the internet fall in love. There have been countless videos of little kids doing adorable, and sometimes impressive dances performances — but this? Beyond adorable! 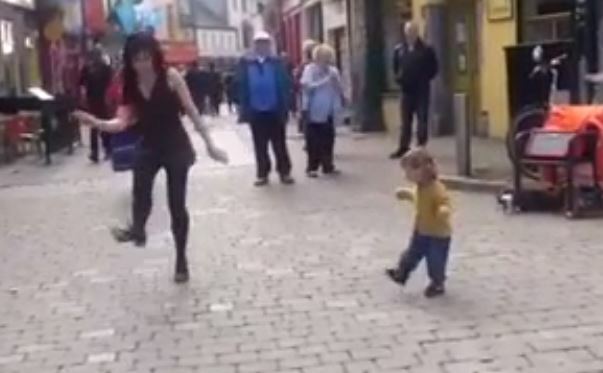 A father and his young toddler daughter named Georgina were walking the streets of Galway City in Ireland. The old brick streets and stone buildings are something out of a storybook. To add to the ambiance — there’s a dancer dancing in the street. The father decides to break out his phone to start filming the street performer dance and Irish jig and to also film his little daughter’s reaction to the entertainment. Little did he know that the video was going to go viral. The adorable toddler named Georgina was about to become internet famous, and she can’t even speak in full sentences yet! Her eyes become locked on the talented dancing street performer, and Georgina can’t help but bust out a move or two herself! The tap-dancing toddler begins performing her own dance, right next to the street artist — what happens next is too cute for words. It’s no wonder people all over the world are swooning over her! Continue to the next page for some serious cuteness. Erin Colleen Spring and Robert Spring, did you guys get to see something like this when you were on vacation? I hope so. My Irish name explains why I love Irish jigs but this little guy makes me love them even more! He’s got talent. How sweet she didn’t give up….both were good…. I could watch this all day. I love the playful way the dancer moves and interacts with the sweet little toddler. Precious.